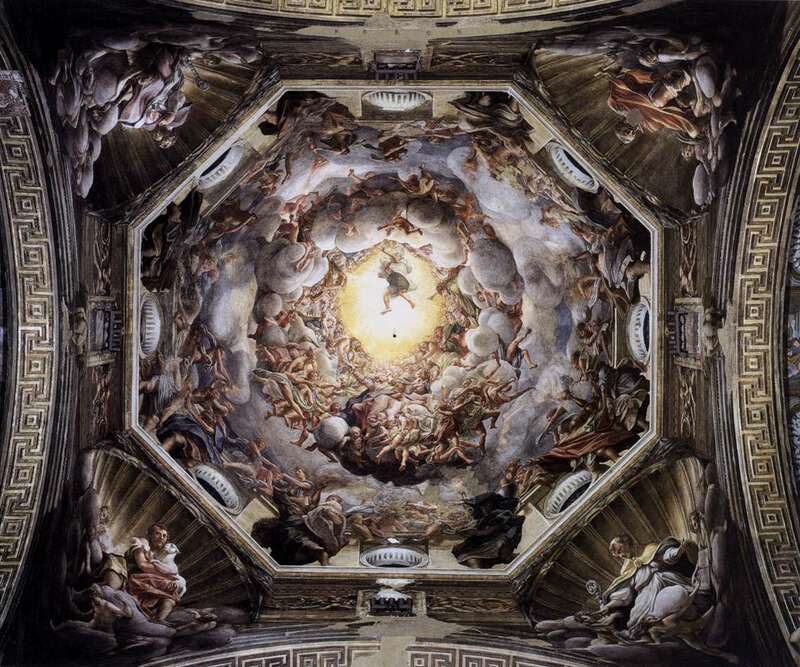 For the last decade or so we’ve been going through a renaissance in traditional religious art. I don’t mean stuff like Matthew Brooks’ “Art for the Catholic Restoration,” lively though it is; I mean Byzantine-style icons. One of the landmark projects is Mark Dukes’ “Dancing Saints,” a work in progress at St. Gregory of Nyssa Episcopal Church in San Francisco. It’s spectacular. And like so much of the new iconographic painting, it takes a very broad view of what constitutes saintliness. The same can be said of Robert Lentz, one of the central figures in this artistic revival. He uses traditional techniques, and some of his icons couldn’t possibly be more traditional; his Our Lady of Korsun, for example. Others are transformational, re-envisioning his subjects, as in the case of his icons of SS. Catherine of Siena, Christopher, John of the Cross, Julian of Norwich, Anthony of Padua, Mary Magdalene, and Perpetua and Felicity. He doesn’t stop there. Acting on his own promptings (or the Holy Spirit’s; not my call), he’s painted icons of such figures asa Albert Einstein, Cesar Chavez, Black Elk, Dorothy Day, Elizabeth Cady Stanton, Harvey Milk, J.R.R. Tolkien, Jalal Ud-din Rumi, John Donne, Johann Sebastian Bach, Martin Luther King, Mohandas Gandhi, Fr. Mychal Judge, Mother Jones, and Steven Biko. I should mention somewhere along the line that the Eastern Orthodox Church has a lively icon-painting scene going. It helps that they’ve never stopped doing it. Fr. William McNichols is another of the major new iconographers. I’m particularly fond of one of his paintings, only partly because I cracked up the minute I first saw it. I’m not sure I can properly explain this. It’s like the Mormon joke about why are crows black (answer: they refused to help the seagulls): too much explanation for a joke that should arrive as quickly and noiselessly as heat lightning. 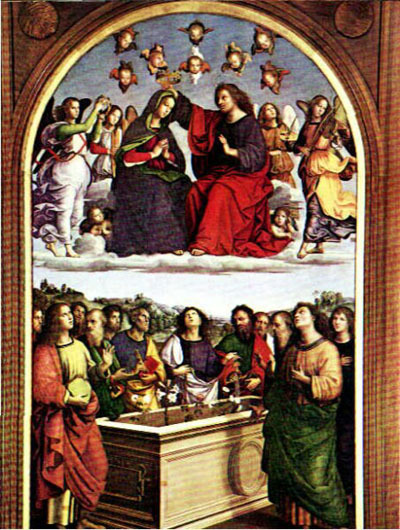 The painting is a Dormition of the Mother of God, and was commissioned by the Jesuit magazine America. The Dormition of the Mother of God, a.k.a. the Dormition of the Virgin, informally “a Dormition”, is another traditional subject. Basically, it’s the deathbed scene of the elderly Virgin Mary. Iconographers have been been painting this one for a very long time. 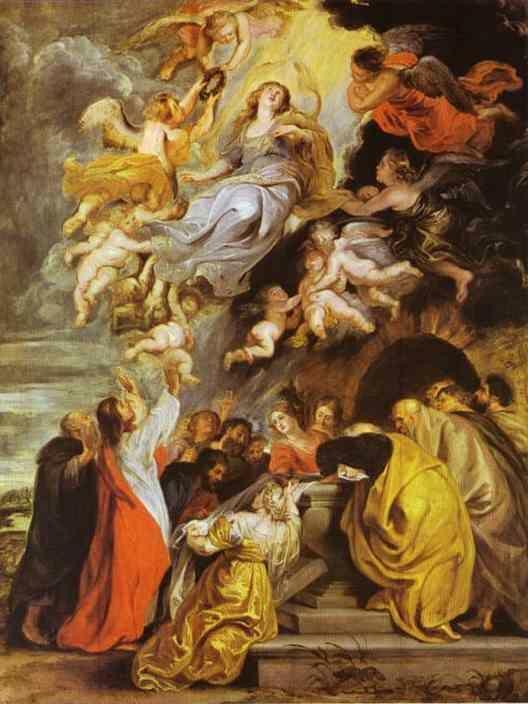 Existing alongside this tradition—sometimes in the same work of art—has been the also-venerable tradition of the Assumption, which instead of depicting Mary dying, shows her being swooshed straight up into Heaven. 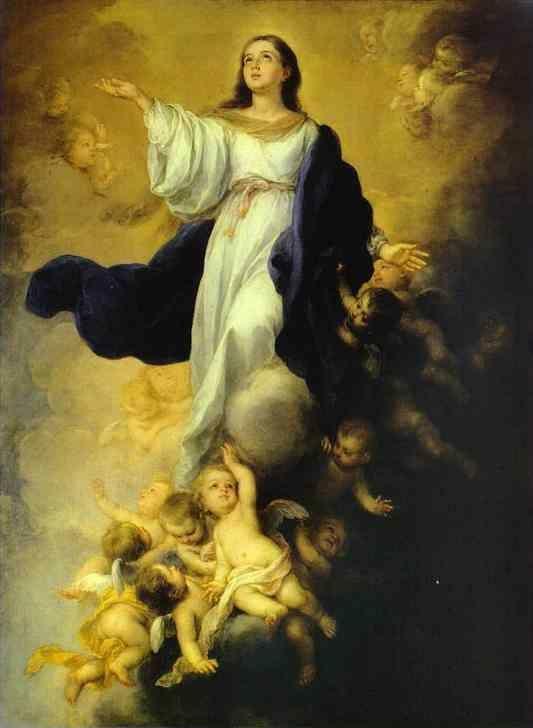 (Jesus ascended, Mary was assumed. It’s the difference between going there under your own power and being taken in tow.) Assumptions are fun to paint, so there’ve been so many them: Perugino, Raphael, Titian, Rubens, Correggio, Poussin, Murillo—for a while there, everybody did an Assumption. It is not Mary that is the point of contention. It is about a crisis of authority and where that authority rests in relation to revealed truth. So, on the one hand, you could interpret Fr. McNichols’ Dormition as expressing a certain amount of doubt about that infallibility business. And then again, on the other hand, it could just be a very nice painting. Let me add a recommendation for your readers: Jim Forrest's book on icons is really, really God, as is the one by the current Archbishop of Canterbury, Rowan Williams. Teresa, I know of at least three icon-writing groups here in DC and they are ecumenical, this thing has broken out of the Orthodox/Catholic nexis. My favorite icon at the moment is a modern one of St. Francis de Sales, he of the voluminous spiritual direction letters, sitting in an airport with a laptop on his knees, checking his email. that was supposed to be "really, really good." I confuse the two all the time. Understandably. Want me to fix it? I sort of like the effect. Melanie, I would (if asked) suggest leaving it that way -- there is something lovely about the phrase. But my favorite is an old icon, Andrei Rublev's The Holy Trinity -- I hae a cheap Russian version of the picture on the table next to my bed. A trip to Moscow would be worth it just to see it directly in the Tretyakov. Oh wow. Oh wow. I have *got* to have that Bach as a t-shirt. Maybe Donne as well, and I'm tempted by Tolkien, but the Bach is just so perfect. I have the Rublev on my walls. Jo, I'm not sure about icons on t-shirts. Something about that bothers me. Here in Buffalo we have a Catholic church, St. Ambrose, which features a number of nontraditional individuals: Martin Luther King Jr. is there, and the Buddha, along with Ghandi, and Chavez, and some others. I was at a funeral there not long ago, and didn't get a chance to look around as much as I'd have liked. The church itself is done in the horrible rec room look that came into vogue in the '70's, but the windows are quite remarkable in their way. The parish is in South Buffalo, and apparently has some history in the labor and social activism movements in these parts. The homily at the funeral was unusually good, and the whole experience put me mind of the scene in "On the Waterfront"-- the sermon from the hold on Christ's daily crucifictions. My first thought, upon reading the headline, was "They don't stand a chance against Susan Kare's icons." We now return you to your regular conversation. Eric, either you or I had to make that comment. Looking at St. Gregory's again, I rememberd what the "Dancing Saints" reminded me of. Last year I was on a day reatreat at St. Nicholas Ranch, the Greek Orthodox camp near Dunlap in the Sierra, a couple of hours from my home. Up above the ranch The Monastery of the Theotokos the Life-giving Spring is under construction. The central church or katholikon has been built, but not completely finised inside, and work continues on the kelia or first section of monastic residences. We were quite fortunate to be taken up to see inside the katholikon, as it was still technically under construction and the county really would frown on members of the public inside. As you can see, little of the inconography has been installed, but the priest who conducted out group showed us the great brass chandelier that hung in the center of the nave. It includes a great ornate ring of lamps with spots for icons to be installed in between, hung from a single point on the ceiling so it can be swing and spun during certain points in some services. It is challed the choros agion or dance of the saints because the spinning and flashing of the icons represents the joyous dancing of the saints in heaven. One interesting point -- we got to see some of the sketches for the inconography, which will come from Greece. What we saw was striking and quite stylized and elongated -- quite ethereal in effect and rather different than I had seen before (perhaps it was just the sketch). We were told that this is the style in Greece, where there is also somewhat of a revival in iconography. Some of these links get "403 Forbidden" errors on the first attempt to load them, but can be opened by reloading. Note, though, that using the "reload" function of the browser may not be the right thing. In Safari, at least, and possibly in other browsers, what's required is to click on the link in the URL entry window and press Enter or Return. The server for these links is refusing to provide them to browsers which are "referred" to them by foreign web pages. The browser provides information to the server on the referring party when it tries to access the linked material. Apparently the "Reload" (typically Cmd-R or Ctrl-R key combination or the Reload function on a menu) function of some browsers repeats the referral information, but opening the link afresh using the URL entry box does not, presumably providing "None" as a referrer. I recall that some folks had problems with this last time and thought this might help, but wasn't willing to do what was needed to test it. This time I remembered to test this notion on the Titian and Perugino links, both of which failed to load and gave 403 explanations. Wow, I really like the Julian of Norwich icon. I'm thinking of sticking it up as the background for my computer. I would get it on a tshirt but I'm afraid that might offend people. I think it's okay to have pictures of, for instance, the cross on a tshirt, some verses of scripture. But should one wear a picture of a figure of religious veneration on a shirt? I'm not sure if I would be comfortable with people putting a picture of Jesus on a tshirt, for instance--and that's my only comparison, as I'm not Catholic. So a question for Catholics: would it be a comparable thing? Would you be offended if people went around with one of your saints on a shirt? First, a minor point. The Assumption isn't dogma, it's doctrine. Second, for Cassandra: No, I wouldn't be offended, if the intention was other than to mock. Cassandra, what is a cross if not a figure of religious veneration? I have a t-shirt with the Black Virgin on it, which I bought during the 1993 World Youth Day in Denver. This is all bringing back memories of my very beloved AP English teacher from my senior year, who painted icons. One guy in our class painted one of her, standing next to her dachshund Gretchen, which she loved very much. I think the John Paul II Cultural Center here in DC is having an exhibition on Russian Icons, for those interested. Was Googling and looking for a name's day electronic greeting for my daughter,and your blog was the first link that came up! Very interesting discussion. Berni is right that most Orthodox would mostly not care for icons on T-shirts, though I know of the existence of many products with icon-style line drawings on them. I am not too comfortable with Lentz's "icons", but I am also not above writing a story in which Jack Frost paints icons on the windows of an abandoned Orthodox church;-) It's a Christmas story, which might be a nice relief from the summer heat if anyone would like to read it-- go to the http://www.sfcanada.ca and click on the "members' fiction" link. re: your remark on dogma and authority-- we Orthodox sidestep this all nicely with an airy quotation whose source I don't remember-- "It is wise not to dogmatize about the Mother of God"!